In today’s competitive era, almost every organization is trying hard to overtake others in the field. Hence, it has become imperative to keep a close watch on competitors so that a winning strategy could be planned. Technically referred to as benchmarking, the process can help decision-makers evaluate their position in the market with respect to their competitors. Similarly, the process can help an IP counsel in assisting the management to evaluate company’s position with respect to its competition. Analyzing patent filing ratio over the years is one great metric that could be used to benchmark one’s own performance when compared to competitors. Paired with other information like amount spent on R&D could reveal major insights on how competitors or the best in the industry are spending on a particular technological area. The metric can help predict where an industry is headed by analyzing the patenting activities of competitors in various technological areas. An increased patent filing in any particular area could be a trend indicating where the investment should be made. 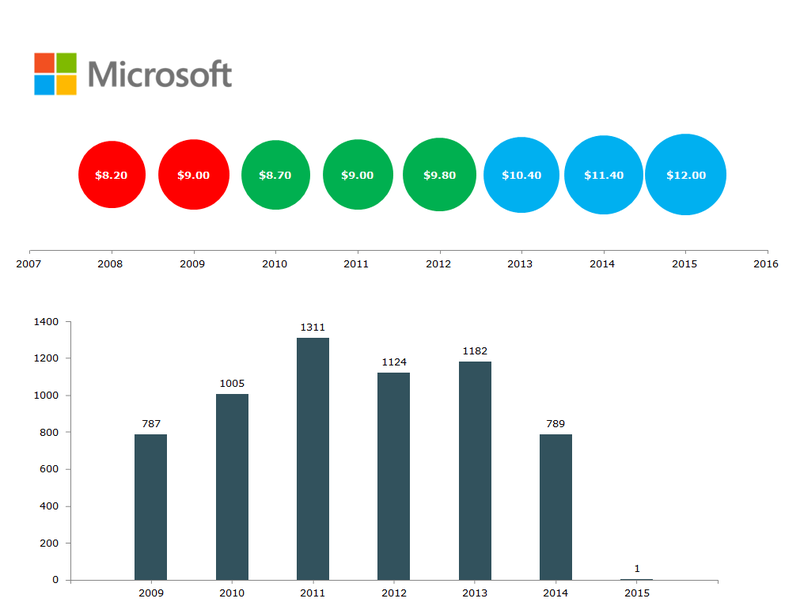 Microsoft, for example, has invested $1 billion in security services and has filed a lot of patents in the domain which is an indicator of its interest. For the companies working in the security services space, this could be a matter of concern as Microsoft has a reputation of converting its research into products. The newly formed Enterprise Cybersecurity Group (ECG), responsible for developing security solutions is a proof of the fact that Microsoft would be a big competitor to look out for in near future in the security domain. Big company approaching alert – On. Investments can tell a lot about the interest of organization in various domains. However, the real indicator that could help judge if the competitor is indeed a threat to their business or not is the number of patents filed by the competitor in a particular domain. Google, for example, in 2012, channelized 5% of its total investment into the energy sector and has committed investing over $2.5 billion in renewable energy projects. This could be “a big company approaching” alert for the companies of energy sector companies. However, patent filing activities by Google in the energy sector is low. This says a lot about the current interests of its in-house R&D department. Another inference is that maybe Google is not ready for energy sector yet and may increase its patent filing in future. Thus, by looking at the patenting activity of Google, an energy sector company can say that the “big company approaching” alert for Google is not ON at this moment. However, they can be vigilant as they never know when Google can shift the gears which only time patent filing activities can tell. IP Benchmarking also reveals data like the yearly patent to R&D investment ratio (PRDI) which is an indicator of the conversion of the amount spent on R&D to the protection offered by IP. At one side, PRDI provides an overview of the strength of the competition. This data can be dug deep to only consider quality patents, as quality outnumbers quantity anytime. We have to be careful while calculating this number as there is always a delay between the time of investment and when the patents are filed. However, if done properly, the PRDI ratio can be a good indicator of Return on Investment (ROI). This is also a great way to measure how much of the R&D spending of the company gets converted into intellectual property. As Matthew Killion once said – “Every penny counts”. The PRDI ratio indeed depicts the protection derived for every penny spent on R&D. And more the value you get out of your money, the better. As an example, consider the patent filing numbers of Google and Microsoft along with the amount spent on R&D over years (in billions). 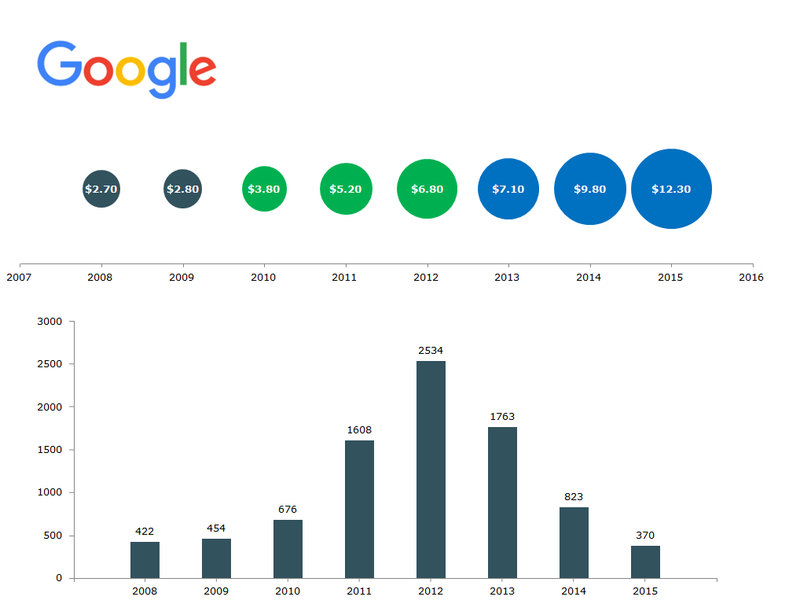 The comparison of numbers of these two technology giants reveals that between the period 2008-2014, Google spent comparatively less but had filed higher number of patents. This indicates that Google has a better R&D output when compared to Microsoft. Microsoft, which lags behind Google in terms of PRDI is not at a total loss. Taking into consideration the way Microsoft converts its patents into products, we can safely say that the patents are worth the cost. But, this is just a bird’s eye view of the analysis. Ideally, one should consider the acquisitions, technology wise spending, the average delay in terms of years to develop a technology, et cetera to come up with a clearer picture. Conventional wisdom says that “knowledge is power.” And people who leverage it are the most powerful. Knowledge in any form if leveraged can help one get a solid hold in every walk of life. From a business point of view, the insights derived from an IP benchmark report would not just help companies evaluate their current position in the market, but leveraging this data could also help them build a winning business and patent strategy. Now the question is –Would you like to take advantage of the actionable insights to make more money and get powerful or continue doing the things you used to do and not succeed in life? This article is great and I really enjoyed it. The process of IP benchmarking, in general, gets avoided in many organisations. A read of this article by people of R&D group can ring enough bell and raise flags to what-to-do-next-time. Thanks for the post , highlighting the ratio of patent in recent years .